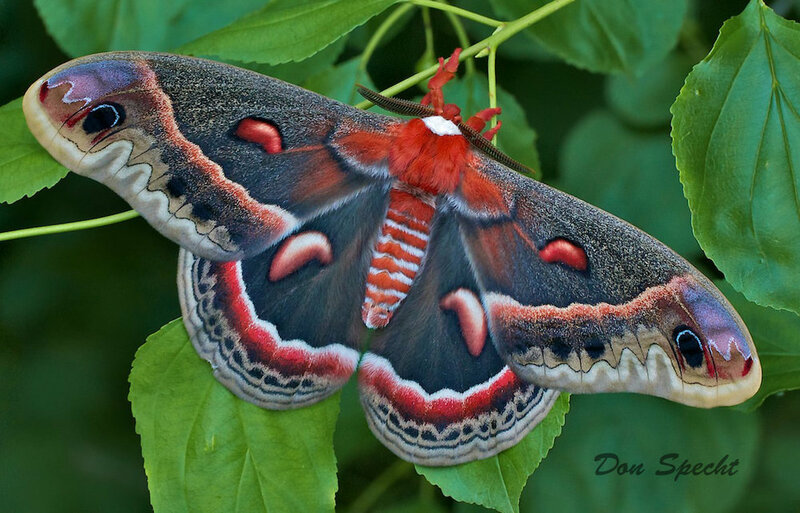 Don says: One of my early childhood memories was of my Dad returning from hunting trips, bringing home Cecropia Moth cocoons. We hatched and released dozens of Cecropias over the years and I remember being amazed at their beauty. I hadn’t seen a Cecropia in many years, although my Dad reported seeing them several times a year at night in the yard light at his summer cabin in Wisconsin. We often talked about “hatching” the cocoons when we were younger and how much fun we had. My Dad passed away several years ago at his cabin at the age of 91. He was always so supportive and encouraging of my photography. On my first “photo walk” after Dad passed away, I was remembering the good times I shared with Dad over the years, and how he had taught me at an early age to respect and admire the beauty in nature. I looked up and saw something on the trail ahead. At first I thought someone had dropped a colorful scarf, but as I got closer I recognized it was a newly hatched Cecropia Moth… the first I’d seen in over 20 years! I was shaking as I put on my macro lens and set up my tripod. I remember thinking, “Don’t blow this one.” I normally put my camera on manual focus with my macro lens, but with the tears drops in my eyes making it hard to focus, I set it on auto focus. It was definitely an emotional and, I might add, “spiritual” experience.